August 7, 2018 by admin	in tutorials. Segmenting your audience, where you divide them into groups you can speak to in a more personal way based on commonalities, is one of the biggest trends in marketing right now. With a quiz you can segment your audience quickly and easily, basically doing the same type of personalization that giants like Amazon do but without all the cost and effort. Today I want to show you three different ways to segment your audience with a quiz and talk through how to use each in a practical sense so you’ll walk away with strategies you can actually use right away. This is the most common and simplest way to segment your audience with a quiz. The way it works is that when you create a quiz there are different outcomes (personalities, scores, etc.) which people will see as their outcome when they finish the quiz. With interact quiz maker you can integrate with your email marketing or marketing automation system and connect each different outcome to a different email list or sequence. That way you can have a different follow-up series for each different outcome either based on the list you add someone to or based on the sequence you add them to. Here’s how to actually use this information by sending a personalized welcome email. 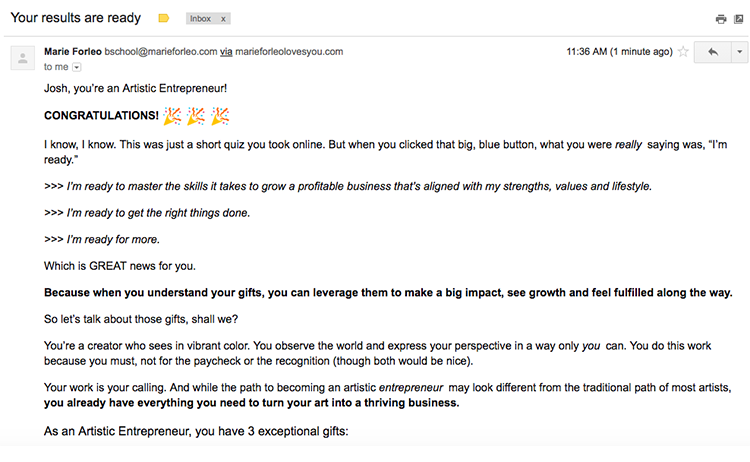 This example is from Marie Forleo, if you want to see an amazing example of great personalized follow-up emails go take her quiz and opt in to get the sequence. Marie has a series of 10 emails for each of the personalities in her quiz and every single email refers back to the quiz personality that you got originally. That way the emails are all in reference to the individual personality and aren’t just email blasts. This is way more effective because it’s simply helping people with their needs based on who they actually are, rather than guessing. Another option for segmenting your list with a quiz is by using answers to individual quiz questions. This can be pretty overwhelming because there are so many options, but let’s look at one particular example that will clarify things. And you want to tag people based on which one they choose because you can send them a “Beginner’s Guide to List Building” “Intermediate Guide to List Building” or “Advanced Guide to List Building” depending on which one they self-place in. There are limitless applications of this one, you can segment based on age, favorite color, interests, pretty much anything that you might ask in a quiz. This option lets you segment your audience before they even opt in. Basically it’s marketing automation before the lead is in your system at all. You can create branches on your quiz so that people see different follow-up questions based on how they answer an initial question. One application of this that has come up a lot recently is in recommending website templates. So for example, you could use branching logic to figure out what kind of template is best for someone and have like 150 different quiz outcomes and then tag people based on which one they get and send a specific follow-up sales email to buy the template or get support with the template for each one. This become hyper-personalized to the point where you’re giving individual advice to people on a massive scale.